“My philosophy on art is that we all have it inside of us. Whether we express it or not, we all have an opinion as to what we consider good or bad art. Although art can be seen in everyday objects, sometimes we are moving too fast in this complicated world to take the time to see it. I have found over the years that expressing art is a must for me, as it relaxes me. It makes me feel whole. I used to make stained glass windows, but I found I was becoming more interested in the leftover shards and pieces and wondered what I could do with them. I sat quietly, listening and absorbing. Thus, a love for mosaics was born. In my pieces, I use stained glass, ceramic tile, glass tile, millefiori, smalti, and items found at the hardware store, among other items. Some pieces are grouted, while others remain without. From the bright colors of smalti with the flecks of bubbles, to the smooth coolness of stained glass; color and texture are my favorite aspects of mosaics and I try to bring a blend of both to each piece. 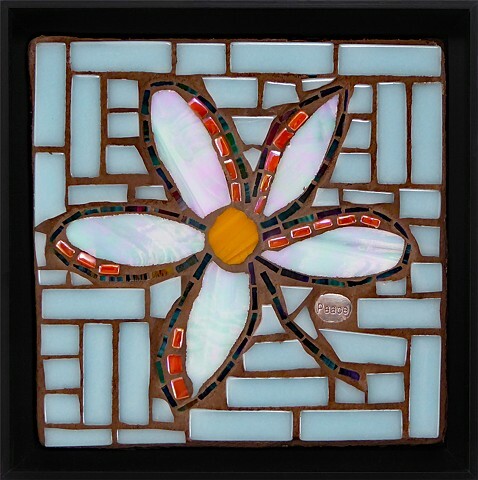 Specializing in mosaic wall art, garden art and jewelry.